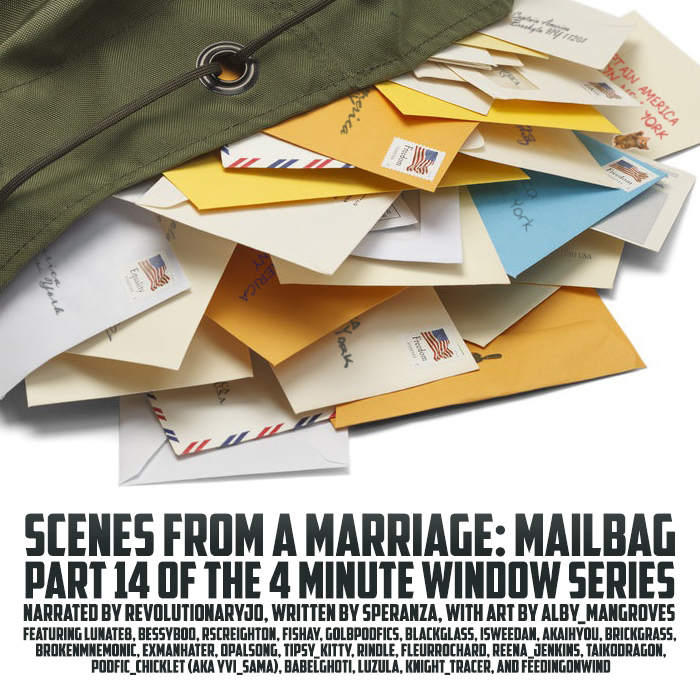 Podfic reading of Speranza's Scenes From A Marriage: Mailbag, part 14 of the 4 Minute Window series. This is the annual advent calendar for the series and features letters written, in world, to Captain America by readers of the series, incorporated into the story as the written work was being posted. Podfic produced and narrated by revolutionaryjo, featuring additional voices from across the podfic community. Inspired by Scenes From A Marriage: Mailbag by Speranza. Also featuring the voices of Fishay and BrokenMnemonic, who don't have AO3 accounts. You can find alby_mangroves's art for this installation within the text here, or it (and some pictures of letters I assume were created by the folks above) should also be visible in the relevant chapters in the m4b file if you're listening on an iOS device if I've built the file right, which not being an iOS user myself is always a bit of an unknown. You can also check out additional art by thigmotaxis here too! Podfic community continues to be best community, in case you were wondering. When I thought I would have to twist at least a couple arms and thrust a microphone at some local friends to cover all 22 additional voices needed for this project, I got 37 volunteers in the space of about half a day between Twitter, Dreamwidth, and the podfichat Discord. My unending thanks, everyone! The last few weeks receiving your audio letters have been such a delight.